Encounter of the excitement in the winter only. There are 2 liners departure everyday. 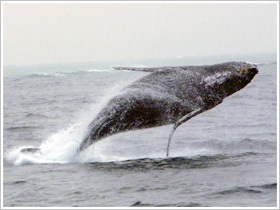 Marine activity is not only in Summer.Winter is the whale`s migration period. These whales come to the warm waters off of Okinawa.It is also can be observed eyes. Overwhelming presence of huge biological!! The power of the humpback whale that can be seen from the close of the spot by boat.The sense of excitement is not to be doubted. 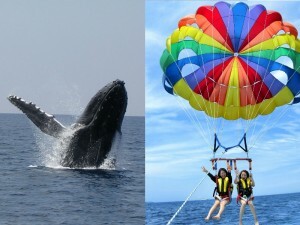 Let`s enjoy the whale watching. Even you are not see any whales, You can choose 100% refund or re-boading. The handbook explains all about the whale. And you can remember of the day with the postcard! The passengers who join the tour depart from Naha, there are free pick-up service from your hotel. ※More information, please confirm the tour detail. 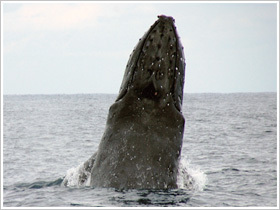 The whale watching tour of Cerulean-blue, we have gotten the words from your exciting experience. If you do not join the whale watching tour yet, please see the voice as a reference and make the reserve online. Finally, the weather is getting better the last day of our journey and the whale watching tour was safely sailed. When we arrived at the point, we saw the whales closely many times. The moment of they dive the caudal fin is an excitement to me. The other families that were suffering from seasickness are inspiring because of that moment. It wa a one page to be commemoration of family travel. Thank you very much on that day.We took boat around one hour, I even didn`t believe we can see the whale. We were lucky to saw the whale at that moment. 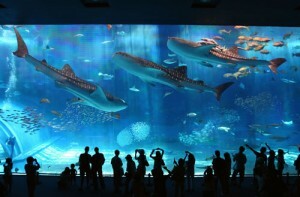 I was suffering from seasickness , but it is not influence me to see the performance of whale. The squirting of whale is a masterpiece. I saw the humpback whale this time! This time is my 7 times to come to Okinawa, but it is the first time to go. So I choose to join the tour that only in this season Whale watching tour. The most uneasiness is seasickness. Just as expected, my wife and two daughters were suffering from seasickness. There are four chances to see the whale, but I just saw two times and took one from video. This kind of experience is a special memories of my family. It is possible to see the whale? Or not? When I was dubious it, I am boarding already. When the boat depart from the port, the ocean was beautiful. It is perfect even just curise only that I thought it. Suddenly, there is tail of whale. The staff was so nice even I asked lots of stupid questions. It is the one ponit that I will join this tour again. Thank you for the important reviews. We are waiting for your join. Therea are strange performance in whale that live in the ocean! Maybe you can understand the feelings of whale from their performance. If you know the meaning of whales, the tour will more enjoyable!! Let`s look at the meaning of the performance of whales. 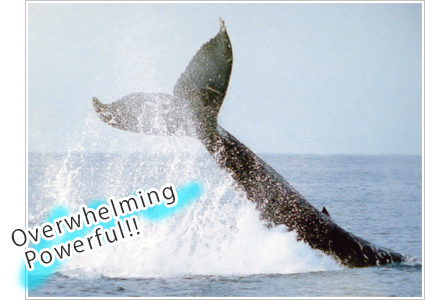 →When the whale was breathing, the whale exhaled air from the blowhole. The blow can be 3 ~ 5 meter . That will be one point to search for the whale in the ocean. There are lots of style of slap. The tail slap is one of that. It is a menacing behavior. The whale will lift the rear of the body to the surface of the sea then sideways and keep striking. It will raise the big sound and the water splash out. The one of three of the body will on the surface of the sea. The dynamic behavior in fall into the sea to striking the water. Whale will lift the body out of the sea and twict the body then fall into the sea. That is one of behavior of the courtship just like jump is very powerful. ※If you bring the camera or smart phone boarding, please take the responsibility by yourself. 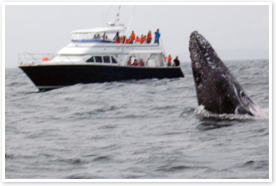 You can find the answer here that you don`t understand about whale watching tour!! In order to enjoy the whale watching tour, you must to check here. Does the probability of spotting whales change based on what time of day it is? "The probability of spotting whales does not change based on the time of day. If you are able to spot them throughout the morning, you may not be able to in the afternoon, and vice versa. Please choose a time that will fit in your schedule and be convenient." "If the level of rain does not interfere with sailing, we will still depart. If we are able to depart yet you cancel because of the rain, you will have to pay a cancellation fee. If the weather is worse thant that, or if there are high waves, then the tour will be cancelled. If it is cancelled, we will contact you on the day before or the day of, and either do it on a differen day or refund you. With the refund, we refund the customer through a bank transfer, but if the tour is cancelled because of the weather, any bank transfer fees will be the customer`s responsibility. Please understand this in advance." "We recommend taking medication to prevent motion sickness 30 minutes before boarding. We also sell mediation to prevent motion sickness at the reception desk for ￥500. People are usually able to avoid getting motion sickness by looking into the distance, sucking on candy, and staying in a well-ventilated area." so please ensure you properly protect yourself from the cold. Additionally, the ship may sway, so we recommend wearing shoes that do not slip easily, such as sneakers." The other questions, please confirm the Q&A page. If you have any question that do not write in the Q&A pages, please contacu us. 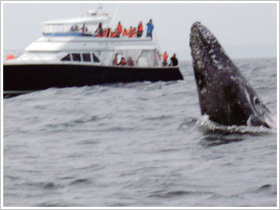 The detail of whale watching tour. Number of travelers at least 2 people. Assemble 30 minutes before departure. Please bring the warm and waterproof goods by yourself. If you worried about sea sick, please take medicin to prevent motion sickness before boarding. Please wear the life jacket during the tour. There are pick-up service from your hotel(only Naha city`s hotel) if you join the tour that depart from Naha. Please let us know when you make a reservation, if you need the pick-up service. "If you join the morning course, we will let you know the pick-up time in the evening the day before tour day. If you join the afternoon course, we will let you know the pick-up time around 11:00am on day." We will pick another customers up from other hotels, so the pick-up time will be earlier or take a long time to another hotels. We recommend that go to the port by yourself if you have a car. If you don`t see any whales. Since the whales are wild and unpredictable animals, there is some possibility that you may not see any whales. 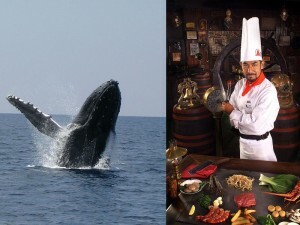 In case you don`t see any whales, we offer other choice for you. ※Except for the conditions below. Whale blow (exhaled air from the blowhole) was seen. If the other members of your tour had spotted a whale. There is more ! 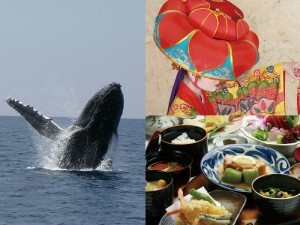 The special combo with Whale watching Tour ! !